The Pre-Primary Program is designed for 18 month to three year old children. This program is designed specifically to prepare children for the primary classroom. It is truly a miniature version of the primary classroom. It is truly a miniature version of the primary classroom. 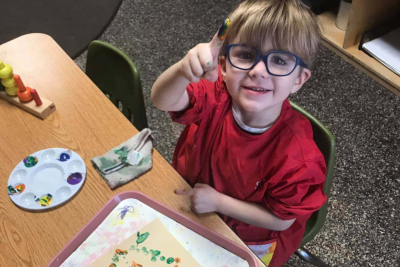 The primary goals of the pre-primary program are continuing the development of communication skills, as well as social and emotional development, aiding the student to become more independent in addition to the academic focus of the classroom. The classroom is equipped with practical life, sensorial, math, language, science, geography, arts, and music. Toilet training will also be a goal for children in the pre-primary program to prepare for the preparation of the primary classroom as well.